The roofers at ECO Commercial Roofing are here to offer modified bitumen roofing in Texas, Louisiana, and Mississippi, along with other roof services that consist of installations, repairs, and maintenance. Since the 1970’s, this roofing system has been supplying office buildings across the U.S. with sloped or flat roofs, offering strong security. There are two types of modified bitumen roofing, APP, and SBS, and our professional roofers are able to install, renovate, and maintain these roofs, guaranteeing we are able to take care of all of our customers. When you want a roofing system that is cost-effective, withstand outside elements, and is incredibly durable, a modified bitumen roofing system is an excellent option for office structures. Our roof business is ready to work with you to get you a greater working roofing system, so call us today at (833) 200-0571 for modified bitumen roofs in Texas, Louisiana, and Mississippi, for a fantastic roofing system for office buildings. Why Choose a Modified Bitumen Roofing System? Modified Bitumen Roofing Is A Popular And Reliable Form of Commercial Roofing. Since this material is simple to install and is quite inexpensive, customers can save more money in the long-term on repairs and various maintenance. A modified bitumen roofing system is able to hold up for two decades due to it's incredibly sturdy material and the reality that it doesn't require much roof upkeep in order to function properly. We like our clients input and present them options, a modified bitumen roofing system can give you selections from the way it’s installed to the manner in the finished material appears. Having a sturdy roof is incredibly critical if you own a office structure and modified bitumen roofing systems are extremely resilient, impervious to holes, tears, and great for every environment you live in. Call the expert and certified roofers at ECO Commercial Roofing by dialing (833) 200-0571 when you need additional information about modified bitumen roofing in Texas, Louisiana, and Mississippi. Superior roof installation equals better performance and the roofers at ECO Commercial Roofing will supply installation that is always done properly. Roof services that include installation, maintenance, and renovations could supply commercial structures with more long-lasting security, and our roofers can accomplish this with our quality workmanship. By hiring licensed and experienced roofing contractors and using the proper tools and products, we are able to ensure that we can invariably install your modified bitumen roof correctly on your commercial structure. 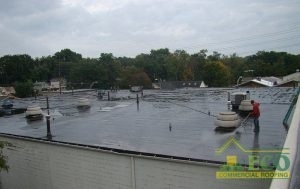 For amazing modified bitumen roofing that include installation, repairs, and maintenance, you are able to contact the licensed roofers at ECO Commercial Roofing to assist you. Contact our roofers now at (833) 200-0571 if you are wanting to schedule a consultation for expert modified bitumen roofing in Texas, Louisiana, and Mississippi.